Francis Mallett and Paul Somerville greet the first canvasses to arrive from the UK. The hanging team. Left to right: John-Paul Somerville, Kevin and Wayne Lewis, Ben Somerville, Francis Mallett. Exhibition co-sponsors Paul Somerville and A J Acker lend a hand before opening night. — at Spinnerei, Leipzig. The Werkschau gallery at Leipzig's Spinnerei. Opening night, 22 June 2013. — at Spinnerei, Leipzig. Film-maker Jeremy Elman with Anna Navas (right) and Tova Lenkiewicz. — at Spinnerei, Leipzig. Opening night, 22 June 2013. — at Spinnerei, Leipzig. Francis Mallett, curator of the show, addresses the guests at the opening night. — at Spinnerei, Leipzig. Panel discussion, Sunday 23 June. The panellists were Prof. Arno Rink (holding microphone), artists Rayk Goetze (right) and Miriam Vlaming (left), and curator Francis Mallett (second right) from The Lenkiewicz Foundation. The discussion was moderated by Mark Gisbourne. — at Spinnerei, Leipzig. Panel discussion, Sunday 23 June. Louise Courtnell's demonstration of tonal painting at the Spinnerei, 13 July 2013. Louise Courtnell with sitter Heide Bernhöft-Hansche. 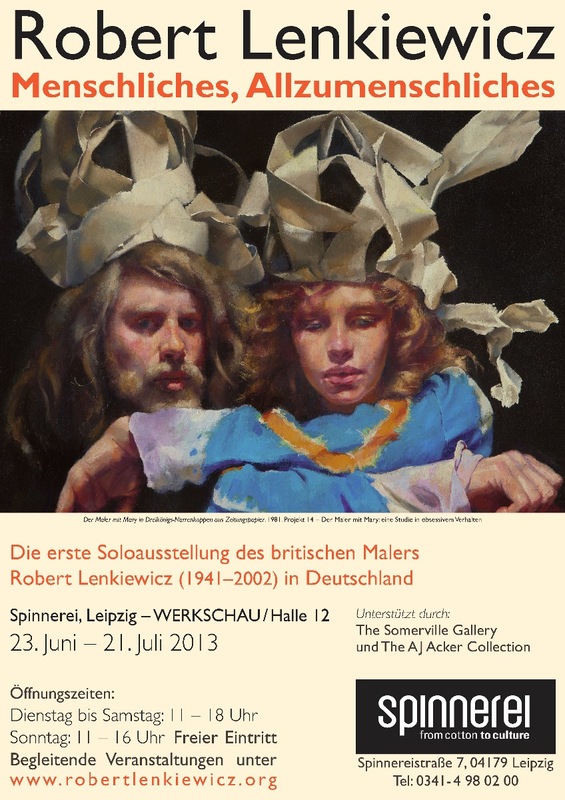 This landmark show will be the largest exhibition of the artist’s work to date, recognizing a number of cultural and biographical connections between Lenkiewicz and Leipzig. His Polish-born Jewish father was a horse trader in Saxony before escaping just prior to World War II. According to family tradition Lenkiewicz’s great grandfather was court painter to King Ludwig II of Bavaria. His great grandfather’s portrait hung in the Jewish hotel in London run by his parents where Lenkiewicz grew up. Encouraged by his mother, Lenkiewicz became fascinated by the great figures of nineteenth century German culture, in particular, the work of philosopher Friedrich Nietzsche, whose phrase ‘Menschliches, Allzumenschliches’ lends its title to this exhibition. The Lenkiewicz Foundation has enjoyed much recent success in the UK with a busy programme of exhibitions and educational events, thanks in large part to the remarkable philanthropy of American patron AJ Acker, whose collection forms an important part of the exhibition. We feel there is a natural affinity between the city of Leipzig and the work of Robert Lenkiewicz. Painting in the figurative tradition, his work was deeply unfashionable with the established British art scene of the late twentieth century, whereas there are clear links with the painters of the Leipzig school. This exhibition is both an opportunity to introduce Leipzig to Lenkiewicz’s work and ideas, and at the same time, a reunion with the culture so instrumental in forging them. View a video introduction by curator Francis Mallett here. Transcript in English of the panel discussion held on Sunday 23 June. Check the Events listing for gallery guides and other scheduled events. Belle in the Kitchen. Diogenes at Night in Studio Window. ‘Mouse’ with Wool – Interior. Group in Eton Avenue Studio. The Painter with Samantha. The Painter with Benedikte. Reuben with needle. Study of Kevin Gasson. Still-Life: three chairs. Mary Flayed, Marsyas. Self-Portrait Fantasising Playing Mary... Self-Portrait. Suicide. Florence Kate Harvey – 103 years old. The line of thought manufactures fear.